Stop! Do not buy that copy of Call of Duty: World At War! If you really need a fix of World War II era shoot ‘em up action, cool your jets for this summer’s Call of Duty: The War Collection. Activision appears to be exploiting three of the Call of Duty franchise’s WWII-iest first-person shooters, bundling “complete versions of Call of Duty 2, Call of Duty 3 and Call of Duty: World at War” into one Xbox 360 package. Complete, eh? There’s no mention in the collection’s product listing that the downloadable content released for those games would be included, so don’t count on it. 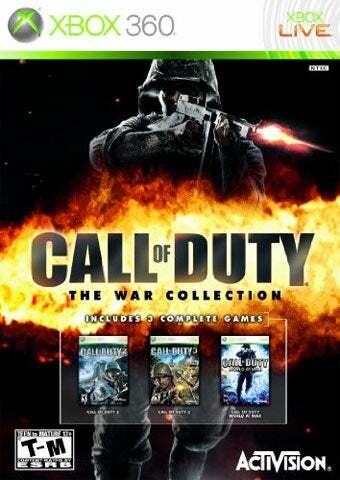 Amazon.com and GameStop list Call of Duty: The War Collection for $59.99 USD with a release date in June in North America. The bundle appears to be an Xbox 360-only product, at least from listings at online retailers.